The face of corporate learning has changed. It is no longer possible to develop your human capital with a single approach. Today’s corporate environment calls for out-of-the-box thinking, incorporating the advantages of many types of learning to benefit your company’s single biggest investment: your people. 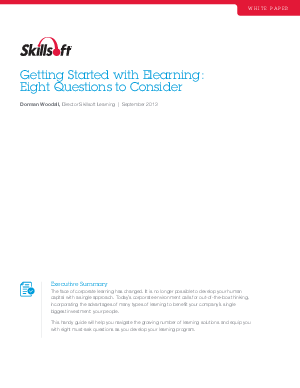 This handy guide will help you navigate the growing number of learning solutions and equip you with eight must-ask questions as you develop your learning program.